Nextsoft Time & Attendance allows you to collect attendance data, schedule employees, calculate overtime, track tardy occurrences, determine who didn’t show up and other attendance issues. An annual Attendance Calendar provides a useful summary overview of attendance data for employee reviews, such as days an employee was sick or late, vacation taken and key dates, such as hire date or birth date. Supervisor functions include an exceptions and approvals function for approving daily punches, and a timecard summary to review total hours for the week. An auto-approval feature allows the system to automatically approve punches based on meting predetermined criteria. On payday, total hours and overtime are fed directly to Payroll to streamline the entire attendance and payroll process. The heart of any time and attendance system is the rules engine which controls how punches for IN and OUT turn into timecards with hours and exceptions. When combined with a data collection device, timecard creation can be automated. Rules control rounding, scheduling, tardy, overtime, lunches and breaks and other aspects of calculating hours worked. In addition, different rules can be created for different work groups, so the office might be different from the warehouse. Rules also allow you to decide which events cause an exception and which qualify for auto-approval. You might want to flag overtime as an exception for manual approval, while undertime is not. 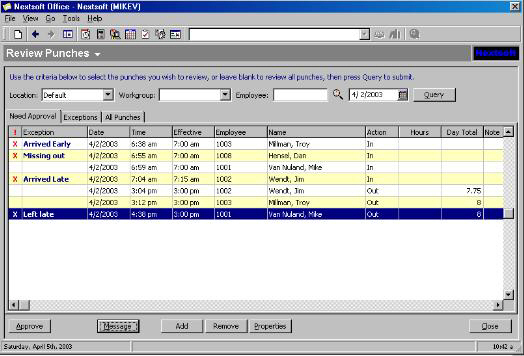 Each Work Group and corresponding set of rules can then be customized to that Work Groups unique requirements. Tracking the type of activity an employee is performing is also a function of the Time & Attendance system. While creating timesheets, or with the use of a data collection device (electronic or biometric time clock), enter the activity code for the work being performed. The activity code is then associated with the next segment of hours, and can also override wage rates and rules. Workers Compensation insurance affects all workers, and can represent a significant cost to business. By tracking activity codes for hourly employees, you can manage workers comp rates, and maintain a documentation trail to support actual employee classifications. Improve efficiency and streamline operation by automating timesheet creation. Electronic time clocks eliminate the need for manual timecards and data entry. Biometric time clocks also insure that the employees punching IN and OUT are actually present by verifying their identify biometrically, eliminating costly errors and buddy punching. Biometrics also eliminate the need to produce employee badges, which represents an additional cost savings. With each new shift, supervisors can review punches collected from the start of the shift to spot errors, tardies, no shows and other attendance issues. Punches are approved or notes taken for review purposes. If AutoApprove is enabled, only those punches which fall outside the rules for the employee’s work group appear, along with the reason for the exception, eliminating the need to manually approve the majority of punches which fall into acceptable limits. Timecards can be reviewed daily or weekly, and show total hours by day for each employee. Exceptions and notes, along with daily punch activity is displayed alongside each day. Supervisors can also approve timecards from this view, adding notes where necessary. Timecards can be viewed by work group and location, so each supervisor or manager can preview and authorize their own groups hours. Reports show attendance history for any period of time from an employee’s hire date forward. Timecards can optionally reference job numbers, allowing labor costs to flow to jobs and service calls. 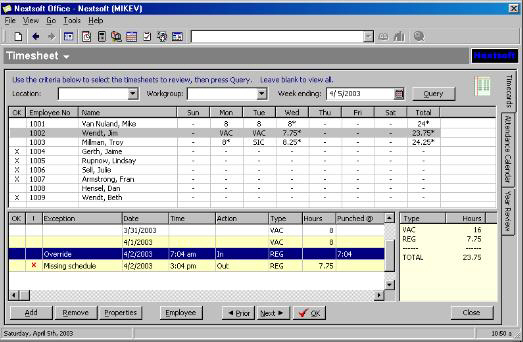 Hour totals, separated by hour type (regular, overtime, vacation, sick) also flow into payroll for hourly employees. Using data collection, such as biometrics or an electronic time clock, punches flow from point of entry to paychecks automatically. Summary attendance information is presented in the Annual Attendance Calendar, which shows all attendance events for an employee at review time, including vacation, sick tardies, early leaves, and other attendance details. In addition, punches and related notes are kept on-line for the duration of employment, providing a complete audit trail of attendance.